Super moist and chewy blondies made with pecans. But that’s not true. I make stuff all the time that I don’t love so I don’t post it to the blog. Only the best stuff makes it here. And these, folks, are the best! 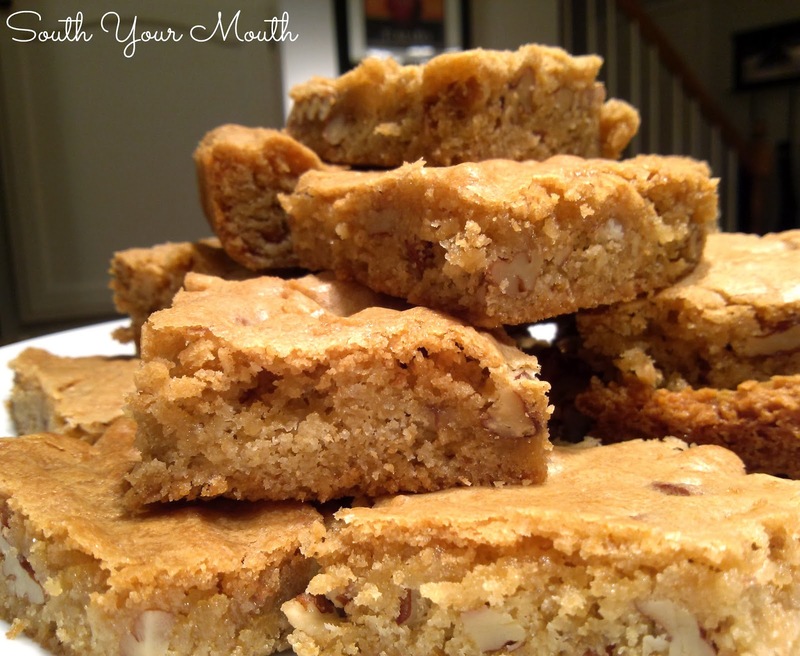 I wanted to do some more holiday baking this weekend and since I had this giant bag of pecans in the freezer, I went online to see if I could find some sort of pecan blondie recipe. I always start with my favorite food blogger buddies when I’m looking for new recipes. And right off the bat I found a two-in-one. 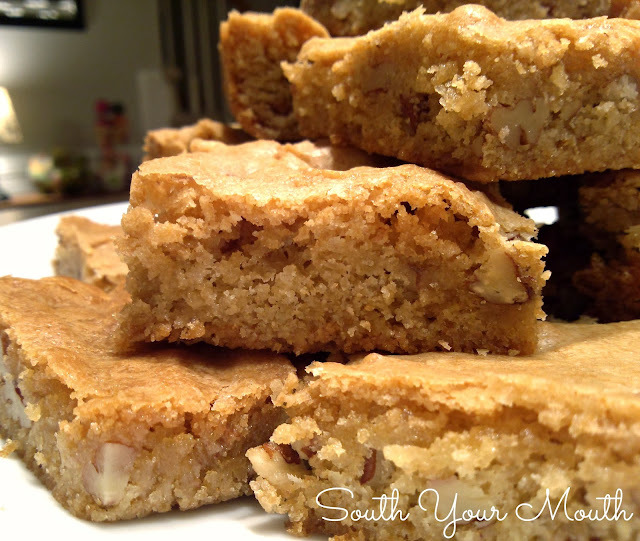 My good buddy Christy Jordan from the Southern Plate had this recipe for Pecan Chewies on her site which was actually a guest post from my other good buddy, Stacey Little from the Southern Bite, sharing his recipe. In the world of mathematical, statistical food awesomeness probability, this was going to have a 100% chance of being amazeballs. And it totally was! I only changed up a few things. I don’t usually keep self-rising flour in the house so I used all-purpose flour with a little baking powder and salt. And I added a bit more pecans because I love them! Cream together butter, sugar, brown sugar, eggs and vanilla with an electric mixer at medium speed until smooth and creamy (about 1 minute). Sift together flour, baking powder and salt. Gradually add flour mixture to butter mixture and mix until just combined and smooth (about 1 minute). Stir in pecans. Spray a 13x9 baking pan with cooking spray. Spread batter evenly into pan and bake at 300 degrees for 40 minutes or until set in the middle and golden brown. Cut into squares and store in an airtight container once cooled. I had this recipe years ago and lost it, I'm so glad you posted this, thanks! My sons loved it! I made these for our christmas treat tray and everyone loved them. They were awesome right out of the oven. Thanks! I agree that pecans can be pricey, but I bought 2 pounds of pecans for $11 at Costco. Same price at Sam's Club. I used them all through Christmas baking and still have about 1 cup left. Where I live in NC we call this Chew Bread and they are so delicious!!!!!!!! Oh Mandy, if only this could be a cookie instead of a cookie bar! Easier to pack in my hubby's lunch as a cookie. Can it be converted somehow? Same as above from TN gal. I tried pecan chews before all the way back from the early 70's in Statesboro, Georgia. A Southern lady made them for me but I never got the recipe. I will try these out. A neighbor use to make a peanut butter version.